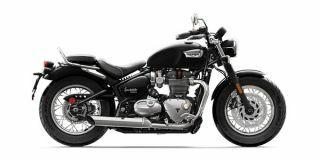 The Speedmaster is a softened up version of the more focussed Bobber, with traits expected of a cruiser. It might miss out on size but it perfectly marries modern technology with vintage design. It gets LED elements in the headlamp, tail lamp and turn indicators, while the vintage Beach-style handlebars are a nice touch. The optional Highway pack ( Rs 1,23,736 excluding taxes) helps give the bike a larger silhouette. The pack includes a front windshield, more comfortable rider and passenger seats, pillion backrest, pannier mounts and two beautifully crafted leather panniers. There are three colours on offer: Red, Black and a two-tone green/white. Fit and finish levels are top notch, as is the attention to detail seen all over the bike. The features list is impressive as well. It has all-LED lighting, ride-by-wire, two riding modes, traction control and cruise control.